Tag Archives for " Jonathan Emmen "
Word-of-mouth advertising has been around since the first shopkeepers opened their stores and began selling to the public. They all hoped that their customers would like their products and their service and refer their friends. Even with all of the changes in marketing down through the centuries, referrals continue to be a powerful factor in a company’s growth and reputation. Today, of course, referrals are made in person, by phone conversations, and, in recent years, via the Internet, most often through social media. If a consumer, for example, is looking for a product that is made by several different companies, then checking online for reviews and contacting friends for recommendations is commonplace. And, if we have had a great experience with a company and absolutely love the product or service we purchased, we will share that experience with our online communities. Referral marketing continues to be a huge factor in consumer purchasing decisions. It’s always great to get new business by referrals. But just sitting back and waiting for those referrals to come in will not make maximize the new business that you could get if you take a proactive approach and actually stimulate the referral process. Here are 7 ways to do that. Ask customers for feedback after the sale and after every experience they have with customer service before or after the sale. Consider your own experiences when you make a purchase. When you have had a great experience, assess your own procedures against the one you had. How do you measure up? What in your customer experience would be worth sharing? Do some research to learn how you can enhance your customers’ experiences and implement new tactics that will work for your product/service. Google analytics has one section that focuses on referrals. 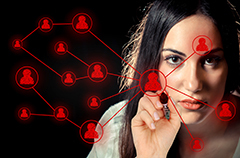 It will show you sites that are linking to you and referring people to you. You can see how many of those referrals were just visitors and how many became actual customers. When you identify the best referring sites, you can then contact them with some proposals to increase those referrals. Set up a link exchange. If the products and services are related, Google is fine with this. You may have to do a bit of thinking and get a little creative, but is there something that you can do that will make the shopping experience truly amazing? One possibility is in your packaging of product for shipment. Trunk Club is an online men’s clothier that sells a complete experience. Shoppers are matched up with a stylist and based upon their preferences, the stylist recommends specific clothing. The customer is sent pictures of the selected clothing items and then chooses which ones to buy on approval. The clothing is packaged very uniquely, shipped, and the customer has 10 days to choose which items to purchase and which to return. Here is a sample picture of how Trunk Club packages its items. What has happened is that customers take pictures of their boxes and contents and post them all over social media. Free referral marketing for Trunk Club on a daily basis. You may need to think outside the box to bring some “wow” factor to your customers, but it will be well worth it. Many e-commerce sites are now putting “Refer” buttons on their pages. Customers have an opportunity to refer friends to the company whenever they are on the site and just looking or making a purchase. And, to make it even easier, once that button is clicked, have a pre-prepared post that they can share immediately. Here is how MeUndies does it. After customers click the button, a pop-up post appears which the customer can send out via email, Facebook or Twitter. (Notice, as well, the discount incentive). Reviews can be powerful referrals. That’s why Amazon has such a huge push to get them on every sale. They even send follow-up emails to customers requesting reviews on products and vendors. Ask customers for reviews and provide a discount on a future purchase in exchange. The more reviews you have, the more trust you garner when new potential visitors arrive. CEO of Dollar Shave, Michael Dublin, in addition to being absolutely hilarious with his video marketing, states that the company gets about 50,000 new customers each month from their referral program. Identify individuals in niches related to yours who have popular blogs, lots of Twitter followers or a large friend list on Facebook. If their niche is closely related to you, chances are your target customers are within that influencer’s communities. See if these individuals have sponsored postings. Also, you should ask if you can send a free product for them to try and then review on their social media platforms. Having a trusted influencer carry a sponsored post or write a great product review opens your brand up to entirely new communities. These 7 referral marketing tactics are easy to implement at very little cost. For a small amount of time, you can enlarge your audience exponentially and find major new sources for sales.